A very famous story I hear all the time is when Hasan and Hussain helping an old man to do wudu, and they teach him by performing wudu themselves, and he sees that he was doing it wrong. I tried to look online for this information, but no one gives the source to this. What is the source to this story? And is this story authentic? This is one of the most oft-repeated stories you hear about al-Ḥasan and al-Ḥussayn (عليهم السلام), speakers throughout the world use this story as an example of Amr bi’l Ma`rūf wa Nahī `Anil Munkar  . When looking through the classical sources of ḥadīth in both Shī`ah and Sunnīs, you do not find this story mentioned. In Shī`ah books you do not find this ḥadīth mentioned at all, the only time you find this ḥadīth mentioned is when a Shī`ah scholar is quoting from a Sunnī book. The first time this story can be seen in Shī`ah books is in a book called al-Manāqib Āl Abī Tālib (The Merits of the Family of Abī Tālib). The author of this book is Abī `Abd Allāh Muḥammad b. `Alī b. Shahrāshūb (commonly known as Ibn Shahrāshūb), he died in the year 588 AH. This book has four volumes and is a book of ḥadīth that has many merits and stories of the Ahl al-Bayt (عليهم السلام). 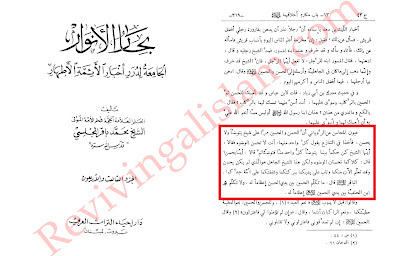 All of the ḥadīth in this book do not contain a full connected chain of narrators, so all of the ḥadīth in this book will be classed as da`īf (weak) because of it being mursal (disconnected chain of narrators). 2. This book cannot be it, because Ibn Shahrāshūb (d. 588 AH) quotes from `Uyūn al-Majālis and he lived about two centuries before the author of `Uyūn al- Maḥāsin, so the book `Uyūn al- Maḥāsin was not authored during the life of Ibn Shahrāshūb. 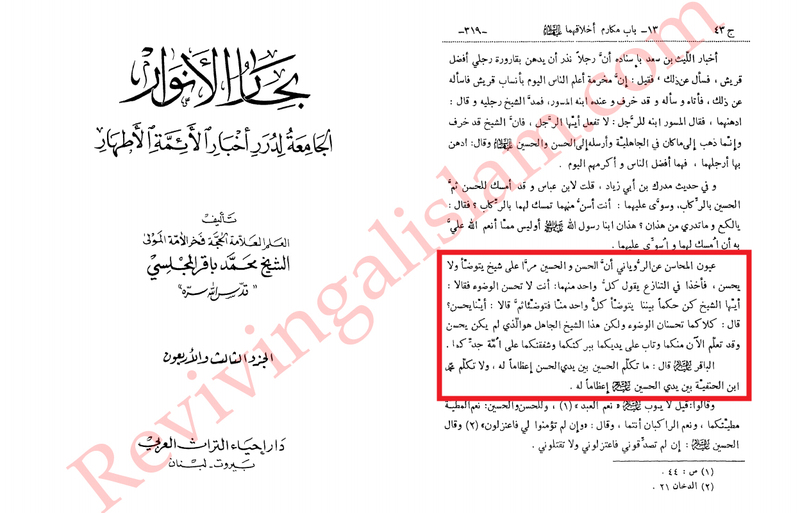 3. al-Majlisī also quotes other ḥadīth from the book `Uyūn al-Majālis, so he had access to this book and used this book in his encyclopedia of ḥadīth. The only book in Islāmic history that is titled `Uyūn al-Majālis is by a Sunnī author named `Abd al-Wahhāb al-Baghdādī (d. 422 AH), a Mālikī scholar. This is a fiqh book, it is a possibility that Ibn Shahrāshūb quoted from this book since he lived before Ibn Shahrāshūb’s time, and this book is extant. 1. This book is a Sunnī book, and Sunnī books and Sunnī ḥadīth hold no weight to the Shī`ahs. 2. The story does not mention a narrator who narrates the ḥadīth; it simply says “My narrators”. This does not count when it comes to ḥadīth science. 3. You do not know who is saying this story, if it is coming from any of the Ahl al-Bayt (عليهم السلام), or from a saḥābah (companions) or tabi`īn (successor). This story is also mentioned in another Sunnī book, much later without a chain of narrators, named Fayḍ al-Qadīr Sharḥ al-Jāmi` al-Saghīr min Aḥādīth al-Badhīr al-Nadhīr authored by Muḥammad `Abd al-Ra’ūf b. Tāj al-Manāwī (b. 952 – d. 1031). Even though this story sounds like something our A’immah (عليهم السلام) would do, there is no definitive way to say that this story is accurate and correct. Therefore, we should not narrate these stories from our pulpit, and we should tell others not to narrate this story. We have many beautiful Ṣaḥīḥ (Authentic) aḥādīth and stories about Imām al-Ḥasan (عليه السلام) and Imām al-Ḥussayn (عليه السلام) that we do not need to narrate stories that are not authentic. This `Imād al-Dīn al-Tabarī is different from the `Imād al-Dīn al-Tabarī (d. after 554 AH) who is the author of the famous book Bishārah al-Muṣṭafa. This book is a commentary of the famous book al-Jāmi` al-Saghīr of al-Suyūṭī (b. 849- d. 911). The ḥadīth in this book are categorized in alphabetical order, like `Abbās al-Qummī has done with his book Safīnah al-Bihār. He is from one of the major Sunnī scholars. It is said that he used to eat very little, because he was very careful about his food. He has authored over 80 books, and spent his life in Cairo, Egypt. 1) You say the following: This book is a Sunnī book, and Sunnī books and Sunnī ḥadīth hold no weight to the Shī`ahs. ^ Why would this matter if this is merely an issue of a historic event taking place or not; we would not necessarily be taking this as a source of deriving a fiqh ruling per say. What I'm trying to say basically is that, just because a historic event for example is mentioned in a Sunni book, wouldn't mean that we can reject it because it is in a "Sunni book" written by a "Sunni author". There are many things mentioned in Tarikh al-Tabari for example that we would take as a source of certain events taking place in history (perhaps because it may not exist in any present day Shi'a book) and we wouldn't reject it merely because it is a Sunni book authored by a Sunni. Of course as long as it doesn't contradict an event that is proven through Shi'a sources that says something else. 2) You also mention: Therefore, we should not narrate these stories from our pulpit, and we should tell others not to narrate this story. ^ There are many stories in history that don't have a sanad, and as far as I know we don't always need to rely on ilm ul-rijal and other complex methods to verify historical events. So all in all, even if there is no way to prove whether this event took place or not, it should still be fair to narrate it from the pulpit given that the orator states that "it is mentioned in fulaan' book" or "I have read this incident in fulaan' book", or "this incident has been recorded in some books". Brother, according to saheeh Hadeeth we should not take Sunni Hadeeth especially in regards to the Ahl al-Bayt and their faDā'il. We have been specifically forbidden from even taking anything from their books if it is not seen in our books. So this is a serious issue and this story is from an obscure source. No chain. No one who is telling the story. Remember someone had to be an eye witness to this event. It is safe to say this is a fabrication.